If you can read this message, we have re-established communication with Qaanaaq. Since nearly three months we have been cut off from the world. The absence of infrastructure has impeded any communication with the outer world during the period in which the ice was forming. ... the temperature has dropped bellow -30°C. 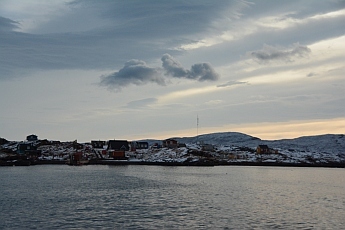 The average temperature for the winter months in Qaanaaq is -25°C; in Qeqertat it is two degrees less than in Qaanaaq and in 'Nanuq's Cove' three degrees less than in Qeqertat. The full moon, which never sets, gives us a day without night. A thin layer of powder snow, which shines and sparkles in the light, covers the landscape: Blue Moon! Magic! Nanoq - the polar bear - has been seen several times in the West. It's the fifth that tries to make it's way up the fjord. We double our care. Accompanied by Sara, our dog, a gun and powerful headlamps we venture out to explore the region in this new light. 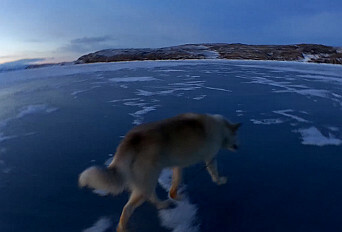 Tomorrow we will transfer part of our dog food onto the ice, a short distance from the camp. This will allow the bear to have a feast and leave us alone, at least for a while. The outside work is finished. We have installed the weather station that measures and logs meteorological data: wind, solar radiation, albedo, air and water temperature and the heat flux that goes through the ice (see science page). The batteries that were intended to supply the installation with electricity do not resist the cold. 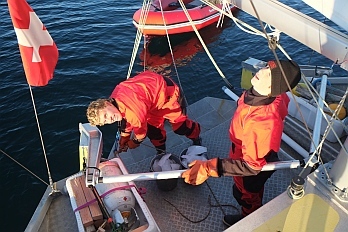 Therefore we have moved the station close to the boat (50m) and connected it to our main electrical system. Everything is ready to welcome the cold. The excellent thermal insulation and the relatively warm temperature of the water below the ice-shelf provide a thermal balance requiring very little energy to make a comfortable dwelling. During the 'day' the heating works intermittently to maintain a pleasant temperature inside the cabin. When we sleep, the heating is turned off, activities stop and the temperature progressively establishes itself around 5°C in the cabin and 0°C in the sleeping quarters. The warm sleeping bags create a warm and cozy bubble around us and guarantee a good night sleep - no need to fight to keep warm. With the arrival of the cold, the 'passive igloo project' gets to it's operational stage. 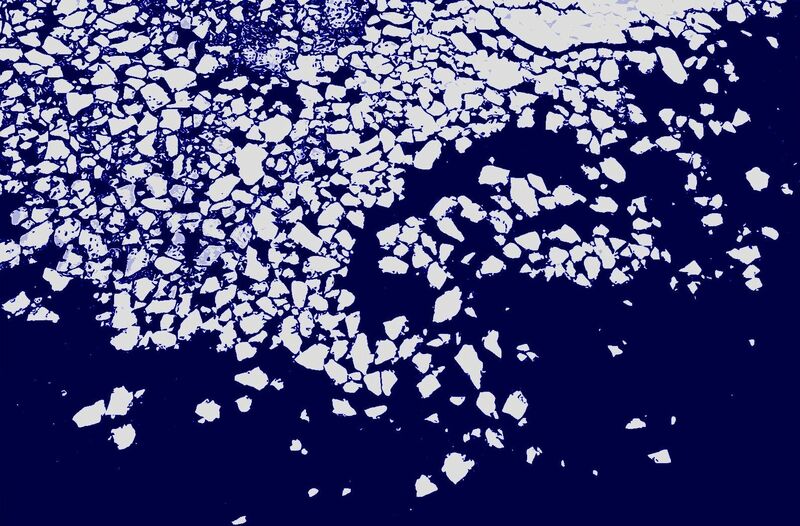 The goal is to spend an arctic winter in complete self sufficiency and without use of non-renewable energy sources, to explore the possibilities and the limits of the passive dwelling of tomorrow. The objective is not to achieve this goal with unlimited resources, as this would be an exclusive luxury. Instead we try to drastically reduce dependence from non-renewable energies exploring robust, affordable, simple and comprehensible solutions. 'A good solution is a solution one can forget about'. Although it is still too soon to draw conclusions on all the systems, the reinforced thermal insulation is without a doubt part of the good solutions. Our fuel consumption is minimal considering the biting cold, the absence of wind and the simplicity of the systems: an excellent insulation, a wind generator and a heat exchanger: 50 liters for one month of comfort. Heat pump and warm water storage had to be abandoned due to our tight budget. A first analysis indicates that over the past month, the primary energy consumption has been of 250W/person. This energy is used for heating, lighting, electrical equipment, warm water and cooking. This is 10 times less than the swiss average. And we are in the arctic with an average temparature of close to -20°C! Above 0°C (the average temperature in January on the swiss plateau) the heating system, also the biggest energy consumer, is no longer needed. The coming winter will allow us to study and learn about how these systems perform in the long run in very cold conditions. And we are looking forward to it! Hence we are heading into the cold, gloomy and magic arctic winter. This will probably be our last message before the end of the year. It will begin its voyage tomorrow when we visit the village; a road with many uncertainties. Our home is onboard Nanuq, no possible return. So we look ahead, towards the adventures to come. We still have to install some sensors that will do an objective observation of what we live in a perfectly subjective manner. The two methods complete each other. We are here to learn about the dwelling and its inhabitants - us - in an extreme environment. For us, Team Nanuq, the idea of passion is about experiencing new colours and flavors, discovering new places, meeting new people, being in close contact with nature and exploring our own limits. What drives us is the possibility to experience, the urge to try new things and the curiosity to understand - and this is exaclty what we do. We wish you joyful Christmas period and a beautiful winter. The barometric pressure drops drastically and we experience the third storm from the South. After a period where we got a small taste of winter (-20°C) and the first northern lights, the sky is low and the wind blows with gusts up to 50 knots. The temperature is positive. The wind brings temperate air from far away. Free from landlines, Nanuq rests well protected in her frozen cradle. The gusts make us heel a few degrees, hardly noticeable. Our 'mooring' is perfect! Rigid like a piece of metal sheet a few days ago, our dinghy becomes soft again, and we take advantage from the warm conditions to fold it and store it away. Now useless, it was of great use to us during the periods of high tide (approximately 3 meters during spring tides), as the ice close to the shore was not as developed. As for now we can cross the delicate zone jumping from one ice cake to the next, making sure not to sink into the soft ice in between. We have finished installing the prototype for the ventilation system. On the one hand there is the need for oxygen inside the cabin, on the other side there is humidity which has to be evacuated. Otherwise the inside of Nanuq would fast turn into a humid and uncomfortable 'cave'. Uncontrolled ventilating would lead to cold air invading our haven of heat. Therefore we use a heat recovery system. The system uses the heat from the sea water (-1.5°C) to preheat the much colder incoming arctic air (-20/-40°C), which will then, by means of an heat exchanger, be heated by the inner warm and humid air which is to be evacuated. The regulation of this process is done according to the inside air humidity. It is a good and simple indicator of human presence and activity inside of the cabin. And it works splendidly! We are curious to learn from future experience. Our visitors are intrigued by the installation half way between technology and tradition: the “buried” pipe is submerged 2m under the ice in the same manner as a fishing net, held by small strings attached to ice clamps (can be seen on the picture). Food - “good food brings good mood” and vitamins are important, even with a limited resources. Energy - managing our limited energy supply due to very slight winds. The transition is complete. Nanuq is ready for the winter. We experience another Sunday in the paradise of ice. Our universe does not stop transforming itself. As by now the day has become twilight. For the past days, the thermometer has been indicating -20°C and continues dropping. The ice grows fast at this temperature and we can now move freely across the bay. It is time to get our legs used to walking on the slippery ice. We discover muscles we never thought we had. With the fresh ice we are happy to receive our first visits from our friends from the village! Our crew has increased with the arrival of a new member: Sara, the dog that the young girl from Qeqertat by the same name borrows us for the winter. She and her father come regularly to join us for “kaffi” onboard. It’s a great opportunity to improve our Greenlandic! We join Thomas to install his seal net and are impressed by the simplicity and efficiency of his device; no tool is excessive. We witness a life illustration of a quote by Saint-Exupéry: “It seems like perfection is achieved not when there is nothing more to ad, but when there is nothing else to be taken away…”. E = mc2 was not written in one day. Identically it took many generations of hunters to perfect this technique. We have a lot to learn from these astonishing and loveable people. This Sunday we install the PCB absorbers. The material, prepared by the the University of Savoie, is easy to install even with biting cold. 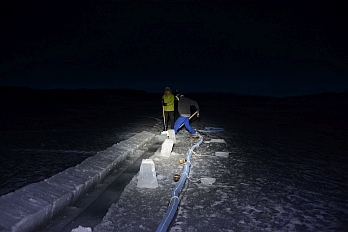 To attach it to the ice we pour liquid water on the feet of out poles, which freezes immediately - in the same way as the locals! The installation will stay at the same place during the whole winter. The analysis will be done next year, on our arrival in Europe. We have prepared the “pulkas”. They are much appreciated to transport the precious drinking water that we fetch in one of the numerous lakes 1km away froth boat. It is far more efficient than carrying 80kg on our backs. 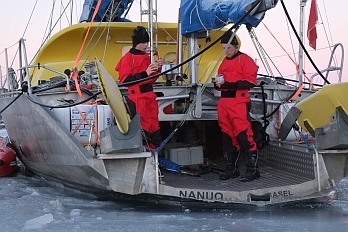 After a day outdoors, we welcome the comfort onboard Nanuq; a warm tea and a large meal to reconstitute the calories burned before. What does the arctic night look like? You may try to imagine the arctic night with interesting information concerning sunrise, sunset, moonrise, moonset and twilight in the tables here below. Civil Twilight: from sunset to the time at which the sun is 6° below the horizon. At this time, there is enough light for objects to be clearly distinguishable without artificial illumination. Civil twilight is the definition of twilight most widely used by the general public. Nautical Twilight: the time when the centre of the sun is 12° below the horizon, and only general or vague outlines of objects are visible, when it becomes too difficult to perceive the horizon. This term goes back to the days when sailing ships navigated by using the stars. The use of a sextant to measure the altitude angle of stars required horizon visibility. Astronomical Twilight: the time at which the sun is 18° below the horizon. It is that point in time at which the sun starts lightening the sky. During the evening, this is the point where the sky completely turns dark. The beginning of November marks the last sun. Most of the day is lit by twilight. The days, being shorter each time, are an always changing spectacle of pastel colours. The cove where we are moored in is now completely frozen in. We have the feeling that we have landed in some remote crater somewhere in the vast Universe. 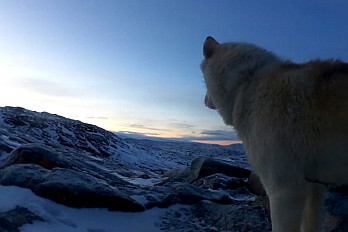 Nanuq looks like a stranded spacecraft on an interstellar voyage. Equipped with ingenuity and resources, she allows us to live in this hostile and exceptional environment. 10 months of solitude separate us from the moment when the ice will clear and allow us to move into open water again and make our way back ... towards our world. The temperatures vary between -10 and -20°C. A freezer! We work outside huddled in warm jumpers, jackets and dry-suits. From far away, equipped like this, we look like astronauts; except for the lack of breathing equipment, for we are lucky: the atmosphere of our planet is breathable. The feeling of loneliness is overwhelming. Except from a rescue operation there is no way back. Until the ice is strong enough, we live in some kind of isolation from the outer world. We rely on our resources. The voyage takes a turn towards becoming an autonomy lab - everything has to be done with the limited resources on board and what nature is willing to offer. The only unlimited resource is our creativity. For example, the notion of waste has nearly disappeared. We don't have much space to store it anyhow. But also, these materials can be useful in many ways. A light bulb in a jam glass becomes a source of heat to keep our compost warm. An insulation panel becomes a polyvalent building material. Many parts and pieces come from reutilizing what we might no longer need or others have discredited as useless. Slowly, through necessity, we learn the art of doing more with less so familiar to the Inuit culture, capable of transforming with genius simple materials into objects with an exceptional value. What a contrast to the consumerist world, which throws away! Passive features, such as thermal insulation or low-e glazing, are so efficient and discrete that we almost forget them. They are simple and essential parts and the expedition would be impossible without! Slowly Nanuq transforms from the Umiaq, the boat, to the Igloo, the home, as the Inuit call their dwellings. Installations, rearrangements and cleaning up fill up most of our days. Our TODO-list becomes shorter each day. We also make surprising discoveries: some condensation has appeared in unexpected places. We add insulation to these areas as well as we can. Therefore our ventilation system takes an even more important role, as well as keeping vapour sources under control: cooking, washing and ourselves. The big wind generator has found her place on deck. She has started to produce her first kWh. We are marvelled to see this machine transform wind, an unlimited natural element to our disposition, into precious electricity. We wish for abundant wind. Are we at the right place for our hopes to come true? The little data concerning wind patterns do not allow us to make a reliable forecast. We will have to adapt to what we get, whether it'll be as we hope ... or the opposite. Our fresh food supply is slowly coming to an end and now creativity is asked for! We have dried pulses, rice and starchy food as our basis. It is time to create nourishing and varied dishes with our limited ingredients. Except for rare occasions we have eliminated pasta - popular dish as it is appealing and easy to prepare - since it uses far to much water and energy to be prepared, as well as producing tons of vapour. We prepare different soups with beans, lentils, and chickpeas. They are easy to be prepared in our pressure cooker. The only thing we have to think of is putting them into water the day before. Seems not to much to ask! We rediscover an ancient art of cooking, a delicacy. To give a range of tastes to our ingredients, we appreciate the different spices we have in considerable quantity. Every Sunday we bake 2kg of fresh bread for the week - a moment in which our igloo fills with the delicious smell of freshly baked bread and becomes cosily warm due to the heat produced by the oven. For bigger occasions a cake or a pizza is added for a change. Except for the lack of fresh vegetables and fruit, our menu lacks of nothing from our terrestrial cuisine. The time for fishing has not yet arrived. 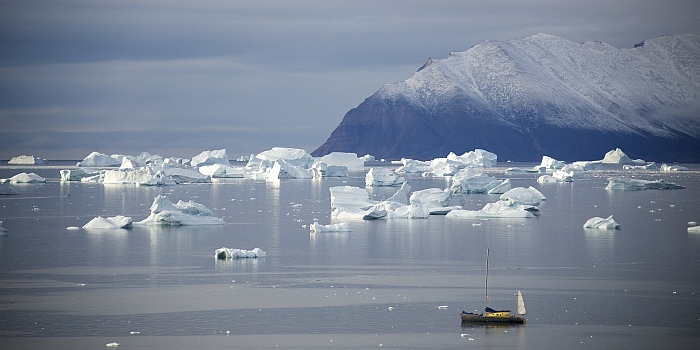 But soon the sea below the ever-growing ice will provide us with the ingredients that constitute the base of the traditional Greenlandic diet. Tonight we have not closed an eye. Ready to jump out of our sleeping bags we take part in the spectacle given by mother nature: a symphony of whistling in the rig, the hull scraping in her ice cradle and bumping against the edges, cracking of breaking ice, a loose band whipping the deck, an object sliding when the boat leans with a strong gust, the landlines solidly installed around rocks cracking on their clamps. Big clouds of snow and dust pass over our hatches. 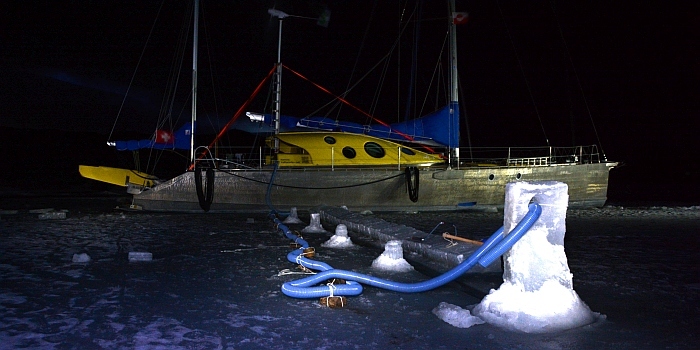 From time to time we switch on the deck light to check that we do not drift away - we don't know yet how boat and ice behave - also to check if our dingy is still there; we have fastened it upside down on leeward of the boat after it tried to fly away a few times - it seems to be behaving now. It's just one more of the southerly storms that leash their force on this region. We were introduced to them during the first days in the apparently sheltered bay, which we originally had thought as being our winter camp. We had been warned about strong winds on the ice cap. The wind speed for our region was forecasted to be 35 knots, a gale easily handled. We believed it for a moment: two anchors and two landlines seemed perfect. ...our opinion changes drastically when the first gusts arrive as if Thor had swung his hammer at us himself. Just in time we let go the landlines and the anchor, to moor a little further into the bay. It was then that the real storm began. In spite of the excellent hold of our anchor, it becomes impossible to resist to more than a few gusts before it would leash. Gust after gust, easily 60 knots, fall over us. The strongest gust exceed 70 knots - our mooring stands no chance. We start the engine at once! It's dark around us. We take down the mizzen sail, otherwise it will be torn away. The wind howls and it is impossible to communicate on deck. The only way the other hears is by shouting at full pitch 2 m from each other. Without any sail surface, Nanuq heals at each gust. The side deck dips into the water. The visibility is only a few meters. Everything is white. The wind has become a hurricane. It tears the water from the sea which has transformed into white foam. The limit between air and water is uncertain. We are on deck, soaked to our teeth, making rounds on the water while waiting for some calm. We are not eager to end up on some shoal and spend the winter there. Although the wind doesn't give us a single moment of rest there are some advantages to our situation: the warm temperature (0°C); these wind conditions in lower temperatures would have been much harder, the full moon allows us to see the shadow of the coast in the dark and our little bay is well protected from the open sea. After a strong gust, we just have enough time to make our way towards the wind beating backwards. Luckily Nanuq has no hard time of sailing against the wind, which allows us to reposition ourselves after especially darting gusts. The diesel engine runs smoothly as if nothing was happening. Reassuring! With the first daylight, the wind turns to the South, allowing us to moor ourselves back to the landlines. It is a delicate but successful operation. As soon as we are belayed on our port clamp, another gust falls over us. Nothing happens, we are at the same place as before: oufff! Now it's time to recharge our batteries. Adrenaline is an amazing resource. Whereas we did not feel tiredness, hunger or cold while on deck, now we have to rest. We sleep, keeping watch in turns. The gusts become less strong. Only a few set off the alarm, which is set to 60 knots. As the day goes on, the wind slowly settles. We look at the disaster on board: pillows and other objects lay in all possible corners, a bowl of spaghettis paints the cabin floor in Italian colours. The contents of the drawers that weren't properly secured lay scattered around. The anchor and chain shine brightly, polished by the ground of the bay. But Nanuq and her crew are solid - not a single scratch. Only the cairn built ashore the day before has disappeared! With what we have seen this night, everything we feared for before seems to be of no importance. We change tactics: we become nomads again and will have a North and a South mooring where we can retreat to, in case a storm approaches. We continue to explore our surroundings and discover a perfect, tiny bay. We ask ourselves if it has not been our wish that has led to the existence of this place, which we had not seen two weeks earlier when we passed close by. Harward Oer 77°29.5'N 66°33,5'W : there are numerous mooring possibilities in this natural harbour which is situated between the two main islands of Harward Oer. The bay we unofficially call 'Nanuq's Cove' can only be used with landlines. Protection from S-ales is good, from the North slightly less. Winds from E and W are moderate. There are several drying rocks in the center of the bay. Further inside the ground is not deep enough. Therefore it is convenient to attach two landlines to the N and two to the S, close to the entry of the cove. Strong straps (such as used on cargos) are perfect to make a good anchor around big rocks. 200m of mooring line are advised. The depth in the entry is around 3m. There is a deep lake at about 1km to the SE, with clear fresh water to fill up fresh water tanks. The landscape is breathtaking with many different hiking possibilities. The distance to the village, Qeqertat, is 2.5km in a straight line, but you need a dingy to cross the bay (if not frozen). Spring tides are of about 3m, half for neap tides. Stormy night in Qaanaaq. The gusty wind form the N blows with up to 40 knots falling down the steep hills over Qaanaaq. The mooring is exceptional, fortunately the ground has excellent hold. 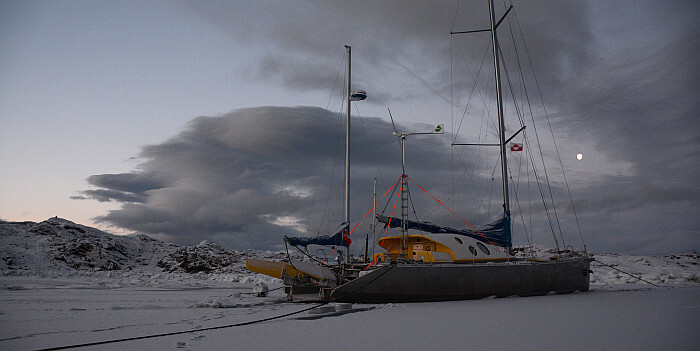 Thanks to our 40kg anchor and 50m of 12mm chain, the boat takes every stormy gust and our igloo stays a haven of peace faced against the wind and weather. The nearly full moon shines a dim light on the icebergs that slide by our window down the fjord and the dust and snow is blown of the hills against the twilight. Two cables ahead the lights of Qaanaaq glow with encouragement. Yes, this improbable place is well inhabited. Hostile at a first glance, these two weeks that we have stayed here have made us understand what it is that people appreciate here. Without doubt, we are facing one of the most beautiful views of the world. 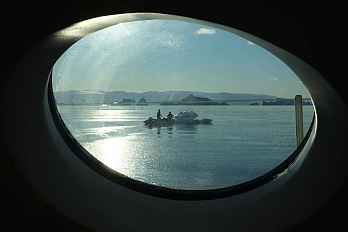 Hans Jensen, owner of the welcoming Hotel Qaanaaq confirms this to us - the view from the Hotel is exceptional. Regarding the organisation of the day to day life, it is done without rush and with respect towards the natural rhythm. There is no reason in rushing one step ahead or to force the impossible. Here time is taken into consideration and there is always a moment for community. We feel welcomed and we try to honour te welcome that is given to us by giving back as much as we can. The opportunities are numerous to exchange and learn from one another, be it while buying supplies, organising the rest of the stay, visiting the school, etc. And so friendship comes to be. We are very grateful for this kind welcome from these friendly people of Qaanaaq, the uncountable times we have been helped, and all the good advice that we have received all along our way! Yes, this country-continent (much more than just an island) is magical, its geography as well as its people. We have much to learn. Yesterday we received the good news: we have the green light from the government and the local authorities to install ourselves for the winter on the Greenlandic territory, here in the Qaanaaq region. As for now, the road is clear: except for the last correspondence with the rest of the world for some time, everything is ready. The internet connection that has allowed us to reach out to everybody will be cut for long months to come. A true detox awaits us. We have learned to be autonomous - nonetheless we will have to rediscover the use of paper post, which will be delivered by dog sledge, and what it means to wait for a reply. But don't worry, the blog will be kept up to date by a combination of technology and old school techniques: a memory stick in a letter! That way we'll keep you up to date, like a friend of ours said: 'it's a kind of combination of the old fashioned way and modernity to achieve efficiency'. And going the other way - you may write a few lines here. Those of you who read these lines, we wish you a beautiful autumn and we'll talk to you through the next post in some time. 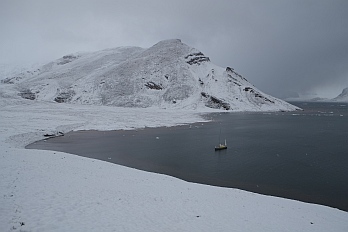 Qaanaaq is also a crucial point for many expeditions. 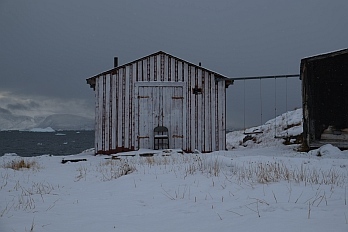 We meet Hans Jensen, the owner of the Qaanaaq Hotel. On the walls of his establishment he shows us endless pictures of expedition teams who stayed with him for a few days. We find nearly everything we need, but we have to anticipate. The supply ship only passes twice a year. 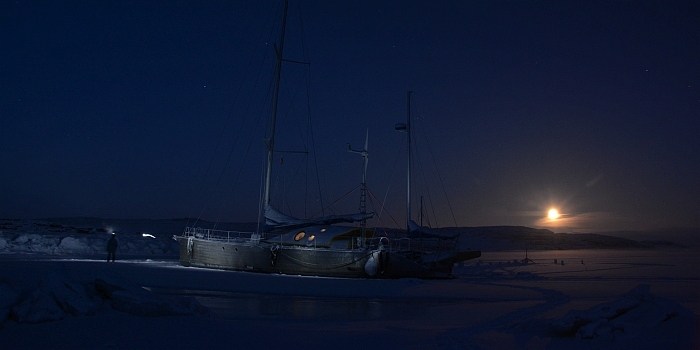 Right now, the Arina Arctica lies anchored before the town. The lighter travels back and forth between the cargo and the coast unloading two containers at a time. It is a long process as they can only work at high tide. The inhabitants are joyful: new stocks for the store and for some there is even a new outboard motor. The empty containers and used machines are ready to travel back to Denmark. After a technical stop and with the permission of the local administration we start our exploration of the fjord. The temperature has dropped below 0°C. The wind blows and it snows. The landscape, mineral and coloured, is now covered by a white blanket. Winter magic! 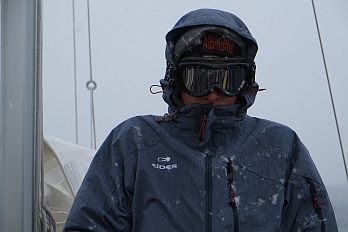 The helmsman, watching out for drift ice, is warmly dressed with warm clothes and a ski mask. We make our way towards Harward Oer, an archipelago that seems to offer several little bays where we might find a safe mooring, maybe even for the winter. It is a natural harbour, 8 miles long, protected by an island to the N and S. Our hopes are exhausted: there are several good moorings, well protected from the sea and the ice. To our surprise, the flora is abundant. It is late in the season, the different plants are pulling back into their roots. Between the rocks, the ice and the snow, these little green valleys offer a hospitable contrast. It is certainly no coincidence that humans have installed themselves here. 4families live in the little village of Qeqertat. They prefer the calm lifestyle close to nature over the busy 'city' life. Still there is regular contact to Qaanaaq (the 'big' city). Maybe it is here that where we will install ourselves for the winter. Except for absence of an Internet connection, all the essential qualities can be found here. 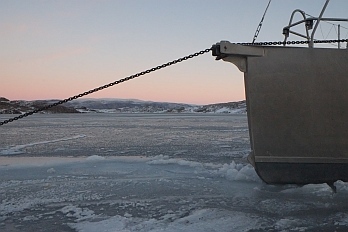 It starts by a good mooring, protected from the sea and the ice but not to closed in so we can still profit from the wind. And even though the language barrier was there, the first contact with the people of Qeqertat was warm and friendly. 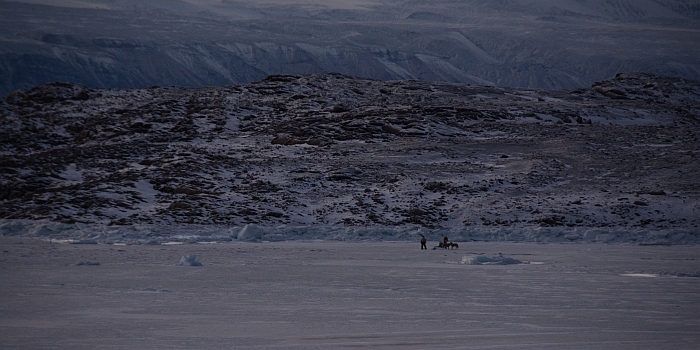 As for now we're heading back to Qaanaaq. Once more, we're mooring in the red waters of Kangerdharssuk, protected from the S wind blowing with up to 30 knots. Summer is over. Like the migratory birds follow the flow of the seasons, it is time for some of us to head S. The small twin engine only flies once a week. Behind stays a small crew and exciting adventure to come! ATTENTION : sailing to the E of Qaanaaq requires a special permission. Ask at the Kommunia for help. It is also recommended to look out for any hunters on the water, as to avoid disturbing them in their activities. Kangerdharssuk (77°33'N 68°35'W): anchorage in 15m sandy/muddy ground. Good hold to the S of the delta. There is just enough space to swing around the anchor with reasonable distance to the shore (20-40m). Good protection except from the N to E. In SE gales ice drifts into the bay. 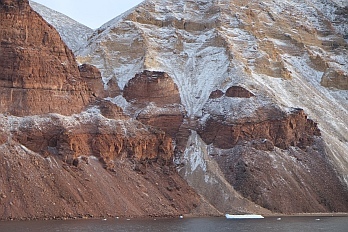 In this case; a temporary anchorage may be found on the opposite shore of the fjord below the mountains at the S end of the delta - very steep but good hold. Rich flora. There are a few huts used by local hunters and rests of a disused village. Easy access to the Piulip Nunaa ice cap. Alpine landscape. 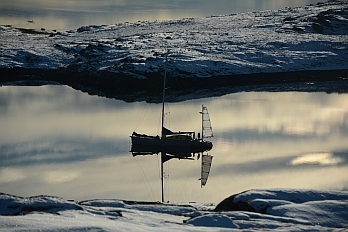 Harward Oer (77°29.5'N 66°29.3'W): the anchorage is situated 2.5 miles to the E of Qeqertat. Good hold in sandy/muddy ground. Protected from the ice and the heavy sea in all directions, but not sheltered from the wind because of the low surroundings. Stay in the middle to cross the bay that separates the N and the S island. Depths not less than 10m. For the approach from the W: Round the S of the little islets (77°29N 66°42W) close to the village of Qeqertat. Access to the mooring from the N. 45min hike to the highest point of the archipelago (numerous little fresh water lakes). Harward Oer (77°30.4'N 66°24.6'W): excellent mooring in a closed bay 4M to the E of Qeqertat. Depths between 8 and 25m. Good hold in sandy/muddy ground. The best protection from southerly winds can be found to the S of the bay, just to the W of the entry passage (moor in 15m depth and tie two land lines to the rocks to the S). Keep clear of the drying rocks all around the shore at a distance of 20-40m. Caution: underwater rocks to the SW of the entrance, aprox 50m from the shore. Green landscape. 15min hike towards the E to a high point with a view onto the vast end of the fjord. 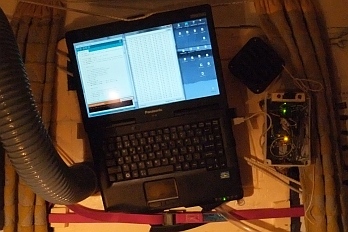 Communication in the region on VHF channel 10.